So, you’ve got past the first hurdle of understanding your tax obligations as a UK investor on a continental European P2P lending platform. Now, before starting to look at individual websites, the next thing to research is how much you would lose in exchange rate fees or spreads. What’s the cheapest and most reliable way to transfer British pounds to Euros? The obvious method is via a traditional wire transfer using your bank, but this is often more expensive. Fortunately, a number of Fintech startups are now offering low-cost ‘P2P’ money transfer services. You probably can’t use Paypal, as it may be against European anti-money laundering regulations which require bank details in the transaction. Natwest: 0.3% (min £23, max £40). Plus £10 agents charge where applicable. RBS: £10 per payment, + perhaps additional charges from overseas bank. HSBC: £4 online, + perhaps additional charges from overseas bank. It’s not clear how competitive the exchange rate is that the banks will convert on, and if there is a spread from the true market rate. TransferGo suggest the exchange rate markup could be as high as 5% for some banks. I looked at 5 different 3rd-party options for doing the money transfer. 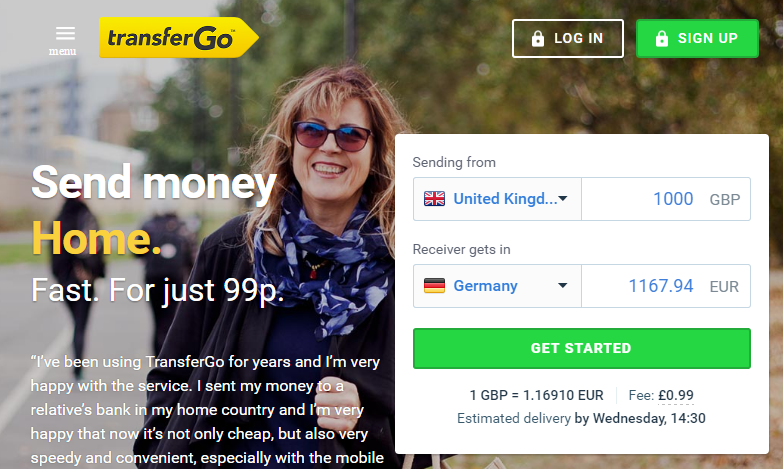 Three of these I’d heard about on P2P forums (TransferWise, CurrencyFair, PaySera), one I’d used quite a lot myself for holidays/work travel (Azimo) and a final one I came across generally searching for cheap money transfer (TransferGo). I checked the exchange rates and fees for transferring £1,000 from GBP to EUR on all 5, at about 9.10pm on the night of 27th February to do a fee comparison. This was the market exchange rate on XE.com: around 1.175 GBP to EUR. 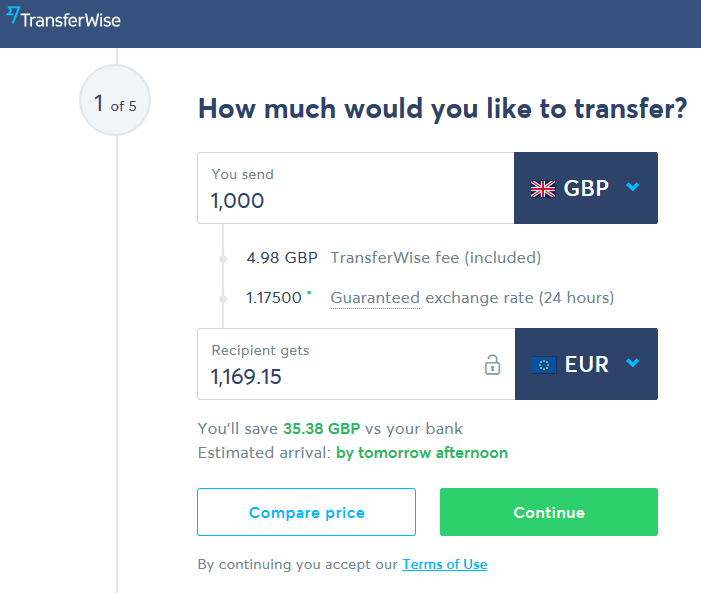 TransferWise charge a flat fee of 0.5% (min £2) to change from GBP to EUR, which seems high, but in practice gave the best exchange rate at 1.175 GBP to EUR. So, for any transfer greater than £400 the expected overall charge is 0.5%. However, for smaller sums than £400 the minimum £2 charge will start to creep up: transfer £100 and you will pay 2%. Compared to TransferWise, CurrencyFair had a slightly worse exchange rate at 1.1696 GBP to EUR, in this case a currency spread of about 0.44% from the market rate. However, the flat fee is lower at €3 (£2.55) bringing the overall charge to 0.695% on a £1,000 transfer. CurrencyFair refer a friend bonus: Join with this code* to get a €30 cash bonus and a free transfer. You have to transfer a minimum of €400 to get the €30 bonus. If this was the right place, then the exchange rate of 1.145 GBP to EUR is the worst yet, a spread of 2.5% to the XE.com market rate. There appeared to be a €3.25 flat fee (£2.77) on top of this. 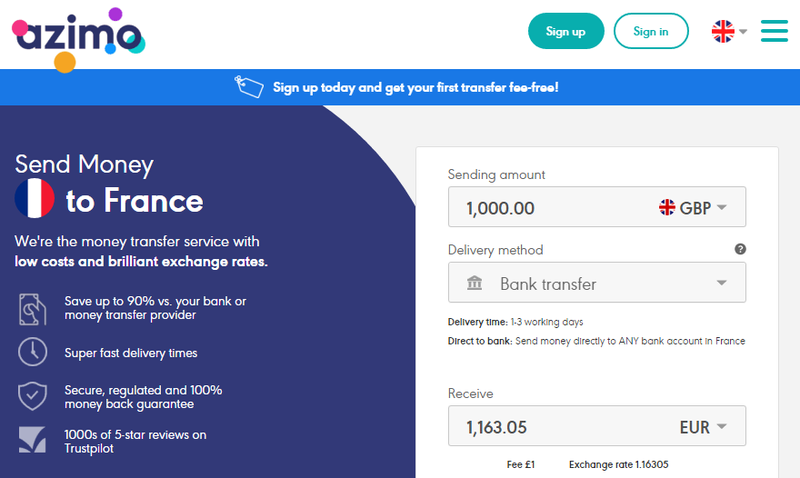 Azimo offered an exchange rate of 1.163 GBP to EUR, a spread of 1% to the XE.com market rate, but with a lower fixed fee of £1. I’ve used Azimo many times for holidays and work trips outside Europe (where my card charges more) and they’ve always been the most reliable for me. For holiday money, I send it via my card to a pickup location where I collect with my passport. However, their exchange rate is often not as competitive as some of other options and this appears to be how they make their money. If you sign up as a new customer with this link you get £10 free*. One nice thing about Azimo is that they often send you free £5 or £10 vouchers during the year or on your birthday to use on £50+ transfers. Of the options so far, Azimo is best for the smallest cash transfers due to the 1% variable + £1 fixed structure. In theory, you could just use it to transfer £50 every time they email you a £5/£10 promotion, assuming that it’s valid for bank transfers and not just passport pickups. TransferGo had an exchange rate of 1.169 EUR to GBP, a spread of 0.48% to the XE.com market rate. The fixed fees were the lowest at £0.99, shaving a penny off Azimo. TransferGo new customer offer: no fee on first transfer via referral link*. For large transfers, TransferWise or CurrencyFair appear to be the cheapest to be the cheapest due to their low exchange rate margin: 0.5% for TransferWise or 0.4-0.5% on the spread for CurrencyFair. Transferwise may be beat CurrencyFair on smaller amounts as they do not add an additional flat fee (€3/ £2.55 for CurrencyFair). The €30 joining bonus* for CurrencyFair means they’re worth a try regardless. Azimo and TransferGo have the lowest fixed fee but their larger markup from the market exchange rate means they are rarely the cheapest, aside from the smallest money transfers or perhaps holiday money. From what I saw in my basic comparison test, PaySera seemed to be the most expensive and least user-friendly. Note: links marked with a * are affiliate or refer a friend links. In this page they usually give you a joining bonus (i.e. CurrencyFair, Azimo), or a fee-free first transfer. One correction regarding transferwise. The fee is not fixed but effectively 0.4975%. If you send £10000 they will charge £49.75. it’s probably close to currencyfair for larger transfers. 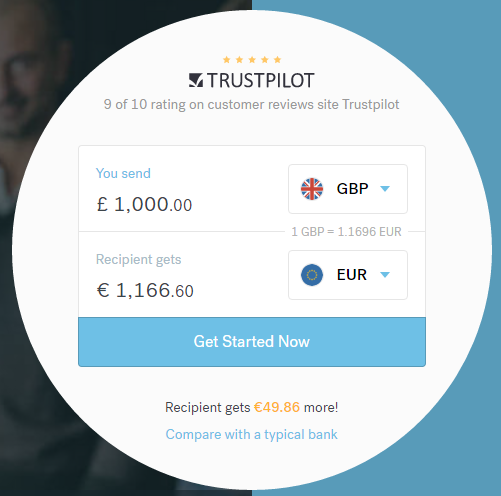 Thanks Cubee, will update the Transferwise section with this pricing! What about moving money in the opposite direction? Can this go via these transfer services or does it need to go direct from P2P lender to bank?